Nyquist gets some love from his happy people as he returns to the barn after the Derby. Once Nyquist returned from the detention barn after the Derby, his happy people quickly hosed down his legs and gave him some love. His barn backs up to Longfield Avenue, which is full of houses and people walking by. Someone across the street started playing ‘We Are The Champions’ by Queen as Nyquist stood there, and his ears perked up as he watched the crowd of people across the street. What a cool horse! 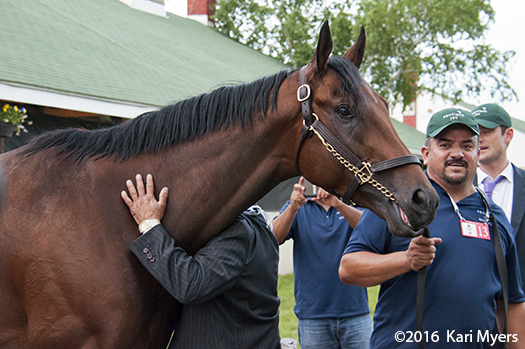 This entry was posted in Racing and tagged Kentucky Derby, Nyquist by Admin. Bookmark the permalink.